The Tecma Group of Companies, as part of its commitment to supporting the community of El Paso, is proud to announce that Tecma’s El Paso team of 7th and 8th graders, competing against high school teams, won the Regional Championship at the University of Texas-El Paso. 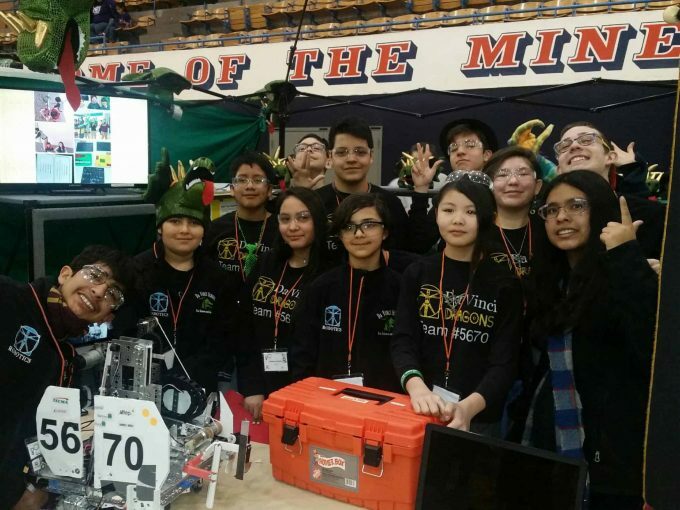 This team of youngsters, under the encouragement of Ed Rubio, Mentor team 5670 and 3043, claimed the BEST DESIGN AWARD in the Robotics division. As one might expect, excitement is high so we’ve chosen to include communications after the award. “Congratulations Ed! Your dedication to those kids is very special and winning is well deserved! You have made us all Proud!” Alan Russell, Chairman of Tecma. Ed responded, in his excitement: “Thank you for your kind words. It was the kids who really came out on top with their creativity and some superb programming. The marketing group slammed it out of the ballpark and wowed the judges. Not bad for 7th and 8th graders who competed against team members graduating high school. It would have been very to difficult for us to do anything without your support and the support of the other sponsors. Your charity helps all of the robotic teams at Davinci. Everything from team shirts, equipment and to pizza during our meetings on Saturdays. No penny has ever been misused! We are in Lubbock Feb 17th for the state regional. I expect 40 teams at the meet and the competition will be even harder. We will see some amazing bots! It’s a fast paced event and with as little as 5 minutes between matches. So, if your bot breaks, it’s an extreme challenge for the kids to put it back together. There are only 4 ways to proceed to Super Regional in Georgia. Win the alliance (as we did here in El Paso), win the design award (as we did here in El Paso, 2 yrs in a row), win the Rockwell Collins award or the most prestigious, the INSPIRES award. Last year, we were close to winning the alliance. We held first place in 4 out of the 5 rounds. We were also 1 of 3 teams nominated for the Rockwell Collins. Very close to going to Georgia and I’ve gotten a little smarter since….